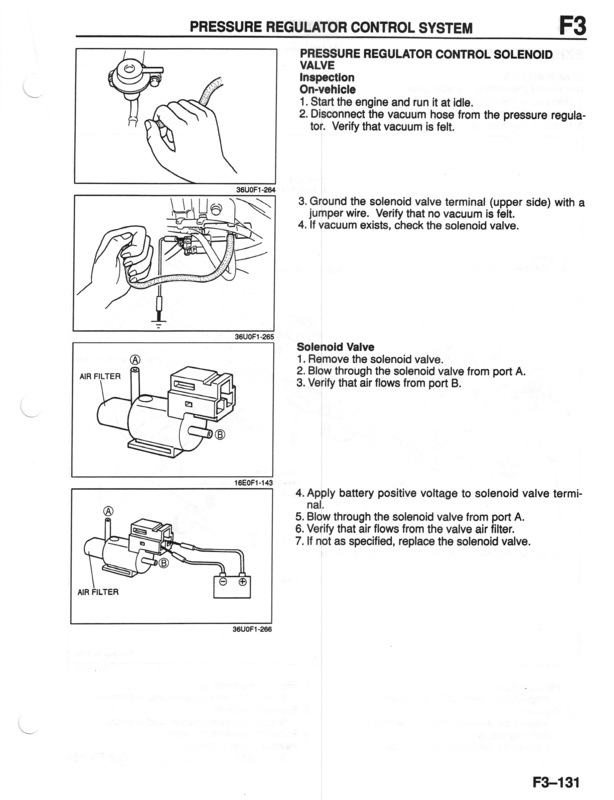 The purpose of the PRC solenoid is to prevent vapor lock of the fuel during hot restart idle. Vacuum to the pressure regulator is momentarily cut and the fuel pressure increased to slightly more than 41.2 PSI. The Fuel Pressure Regulator solenoid is called the PRC solenoid for Mazda vehicles. 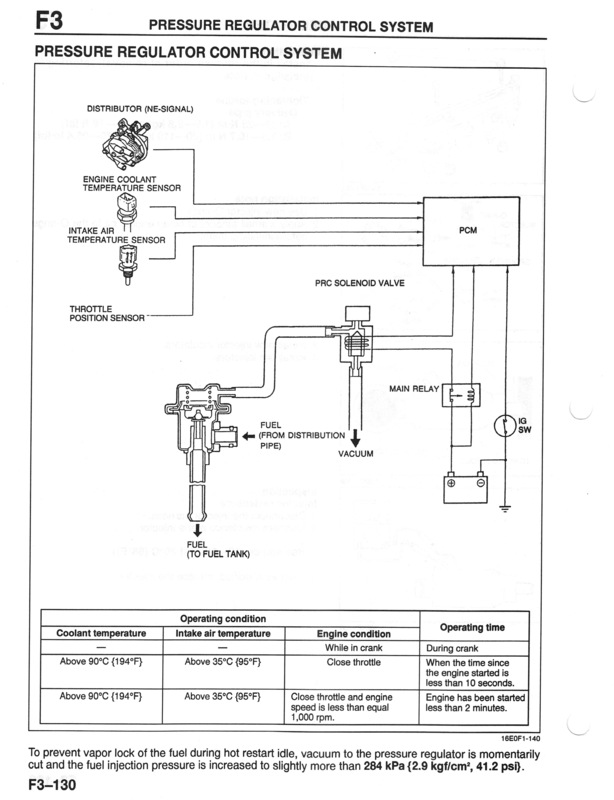 The abbreviation for FPR is taken by the Fuel Pump Relay so PRC is used to denote the Fuel Pressure Regulator solenoid otherwise known as the Pressure Regulator Control solenoid..
(+) After restart. If it's been less than 10 seconds since the engine was turned off, the coolant temperature is above 194F, intake air temperature is above 95F. (+) After restart. If it's been less than 2 minutes since the engine was turned off, the coolant temperature is above 194F, intake air temperature is above 95F and throttle is less than 1000 RPM. Note: the PRC solenoid in the 1998-2002 Mazda 626 was moved to the top of intake runner #4. The design and diagnostic procedures are exactly the same only the location moved. Please be aware that the diagram below 16E0F1-143 is somewhat misleading. There are only 2 pins on the PRC solenoid. The top port on the connector is only for the connectors tab-lock mechanism. There is no pin in the upper port, both pins are in the bottom 2 ports as shown in figure 36U0F1-266. CAUTION: While performing step 4 if you get the pins switched and accidentally put battery voltage on the negative terminal and ground the positive terminal you can fry your solenoid. Make sure you don't have any touching wires between the pins. When you do it correctly you will hear a click as the solenoid opens.